Cumulative downloads for the Cash app now total 33.5 million, exceeding Venmo's 32.9 million for the first time ever, analyst Dan Dolev told clients Tuesday. "If the Cash App continues to grow rapidly, the business could reach or even exceed $100 million in sales by 2020, even without deeper active user penetration," Dolev wrote. The analyst raised his revenue estimates for the company and adjusted his 12-month target higher to $86, implying 18.8 percent upside over the next year. Cumulative downloads of Square's Cash app have surpassed those of Paypal's Venmo for the first time after a monster July, according to data from Sensor Tower and Nomura Instinet. The Cash app's cumulative downloads now total 33.5 million, exceeding Venmo's 32.9 million for the first time ever, after Square's service grew three times faster than its competitor from PayPal in July, the data showed. The No. 1 position should boost Square's shares, Nomura Instinet analyst Dan Dolev told clients Tuesday, with the popular application set to contribute as much as $30 million to $40 million (or 2 to 3 percent) of adjusted net revenues in 2018, he estimates. Square's stock rose 3 percent shortly after the opening bell, pushing shares to an record intraday high. The price is up about 726 percent since the company's initial public offering on Nov. 19, 2015. "If the Cash App continues to grow rapidly, the business could reach or even exceed $100 million in sales by 2020, even without deeper active user penetration," Dolev said in a note to clients Tuesday. "With impressive user growth and ongoing decoupling from Bitcoin, we believe Square's monetization efforts are increasingly bearing fruit." 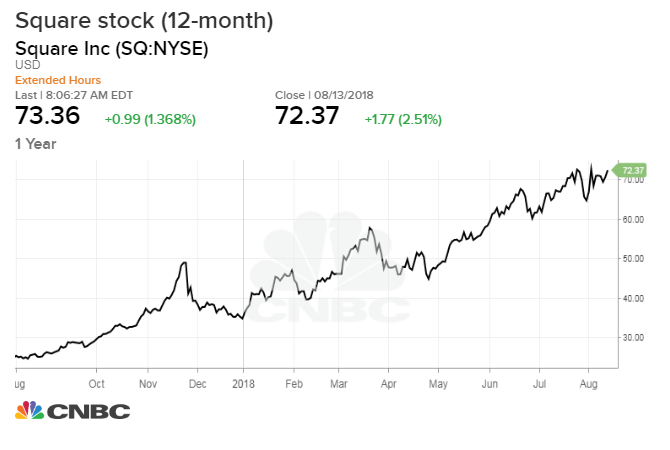 The analyst raised his revenue estimates for the payments company and adjusted his 12-month target higher to $86, implying 18.8 percent upside over the next year; Dolev has a buy rating on shares of Square. Venmo and Square Cash provider users with access to their financial systems, allowing customers to electronically send, store and spend money between peers. Square's chief financial officer, Sarah Friar, told investors during the company's latest earnings call that she was happy to report that the Cash app is consistently a top-30 app in the App Store. In June 2018, Cash app customers spent $250 million with Cash Card, nearly tripling since December 2017 and representing $3 billion on an annualized basis, according to the company's second-quarter release. In the second quarter in the U.S., it was the No. 1 finance app and on average a top-30 free app in the App Store, the company added. Dolev also re-emphasized his thesis that Square is "more than just a bitcoin play," highlighting the Cash app's success despite a recent slowdown in downloads of cryptocurrency platform Coinbase and depressed coin prices. "Interestingly, this relationship seems to go both ways. While Bitcoin prices increased in July and Coinbase downloads accelerated 11 percent, Cash App downloads remained stable at 154 percent, showing little variance from prior months' growth rates," Dolev added. Shares of Jack Dorsey's company spiked in November after a company spokesperson told CNBC that it was testing support for bitcoin trading through its payment app, hoping to capitalize from the then-feverish fascination with the cryptocurrency. The price of bitcoin has dropped more than 50 percent from highs seen last December of nearly $20,000; the asset was last seen trading at $6,021 Tuesday morning.